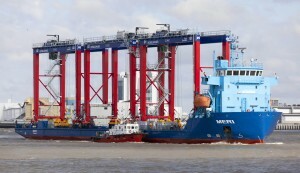 On 11 June the freighter “Meri” was the first vessel handled in the new Russian Baltic port of Bronka. She delivered the first three of a total of ten RTG cranes from Konecranes in Finland. The firm is among the world’s leading manufacturers of cranes and lifting gear. Arriving from Hanko in Finland, the “Meri” was the first merchant ship to transit the new, recently constructed canal providing access to Bronka, then making fast at the already operational Berth 3. Discharge of the three RTG cranes constituted a dress rehearsal for clearance of a vessel at the new terminal in Bronka, in advance of the official start of operations in Bronka in September. Delivered in a state of operational readiness, the RTG cranes rolled ashore from the “Meri” on their own wheels and will in future be deployed at the Port of Bronka container terminal. A second batch of three RTG cranes will be delivered by Konecranes in mid-August. “We are extremely satisfied with the mutually agreed fitting-out of the RTG cranes ordered from Konecranes, and their punctual delivery. At our new Port of Bronka, we are installing highly efficient, state-of-the-art equipment. We are convinced that with these RTG cranes from Konecranes, we shall achieve high operating reliability and productivity in container handling at our new multi-purpose port,” says Alexei Shukletsov, CEO of the Port of Bronka. Konecranes possesses immense knowhow in designing port solutions. The rubber-tyred gantry cranes (RTG) supplied for container handling at the Port of Bronka not only fulfil normal performance specifications but also feature numerous standard innovative functions. While cutting maintenance costs, these also boost performance and reliability. This both enhances operational dependability and minimizes costs for maintenance and spares. In the tough operating conditions in the Russian Baltic port of Bronka, that will be a distinct advantage. The deepwater Port of Bronka is being built on the Southern bank of the Gulf of Finland, on the outskirts of St. Petersburg and near the municipality of Lomonossov. The multi-functional cargo handling facility comprises two terminals plus a logistics centre. Covering 107 hectares, the container terminal offers five berths along quays extending 1,176 metres. The Ro-Ro terminal covers 57 hectares, and with a quay length of 630 metres permits simultaneous handling of three ships. At the first stage of construction, handling capacity of the container terminal totals 1.45 million TEU per year, plus 260,000 units at the Ro-Ro terminal. A first-stage water depth of 14.4 metres enables the Port of Bronka to handle post-Panamax vessels. The multifunctional Bronka handling facility is scheduled to enter service in September 2015.